In my last post, I cited Jeff Frankel’s keynote speech from a recent Bank of Canada-ECB workshop. He also pointed to the end of “Exorbitant Privilege” and “Dark Matter”, and other arguments of American exceptionalism. 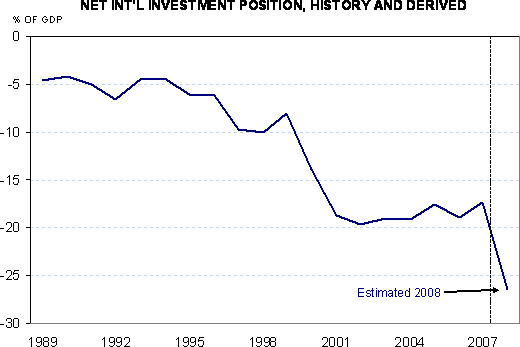 I think we’ll see resounding evidence of this in Friday’s release of the US end-2008 Net International Investment Position (NIIP). 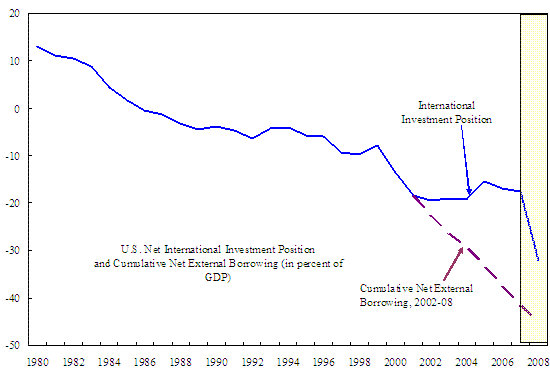 Figure 1: Net International Investment Position, end-year (blue squares), and Cumulative Current Account balance on a NIPA basis (red line), as a ratio to GDP. NBER recession dates in gray shading. Sources: BEA International Investment Position release of June 2006, BEA NIPA release of October 2006, NBER, and author’s calculations. Originally posted here. …and asked if “gravity can be defied?” At the time, I argued the answer was “no”, and observed that NIIP reversion to the cumulated current account series often occurred around recessions (see also ). The new release is likely to also provide the answer “no”. In his Figure 1, he shows what was implied by cumulated current account balances going forward from 2002, and what the actual evolution of the NIIP was. Figure 1 from Milesi-Ferretti (2009). He also provides an estimate for end-2008 NIIP to GDP ratio. As Milesi-Ferretti observe, end-2008 will see a drastic deterioration in the US NIIP. Cline (2009), discussed in this Peterson IIE piece, provides a similar estimate of 30.8 ppts of GDP for 2008, while John Kitchen’s own personal estimate is somewhat less pessimistic, although the differences may arise from how FDI is valued (i.e., market vs. cost basis). But the deterioration is still significant. 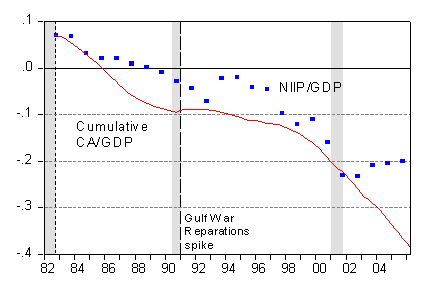 Figure 2: Estimated US NIIP. Source: John Kitchen. Some argue that the privilege to incur dollar liabilities has been earned in a different way: The United States has been appropriately exploiting its comparative advantage in supplying high-quality assets to the rest of the world. Recent examples include Caballero, Farhi and Gourinchas; Cline; Cooper (2005); Forbes (2008); Hausmann and Sturzenegger (2006a, 2006b); Ju and Wei (2008) and Mendoza, Quadrini, and Rios-Rull (2007a, b). In one version, the United States has been operating as the World’s Banker or the World’s Venture Capitalist, accepting short-term liquid deposits and making long-term or risky investments (Gourinchas and Rey). Recurrent upward revaluations in the dollar price of US overseas assets have in effect financed much of the US deficits; some believe that the valuation effects are not an unsustainable coincidence, but rather a component of the sustainable returns that the United States enjoys as world banker. Put me in the camp that says the revaluations are an “unsustainable coincidence”. Some longer term prediction from Peterson Institute for International Economics here.